At the time he was fired from Capitol Records, Vic was at one of the lowest places of his life. In spite of the fact that he had made more money in the previous year than he ever had with The Animals he felt absolutely empty. He had achieved so many of his goals, yet there was no joy within him. His experiences, first with the Animals and then with the LA music scene, had left him emotionally exhausted, with no hope that he could ever trust anyone ever again. At only 24 years old, he could feel that he was losing his health and was even wondering about his sanity. In fact, the firing had not come in a vacuum. For more than six weeks Vic had been practicing daily meditation and had been praying for a change in his life. Still, this new turn of events came as something of a shock. That week the LA Free Press carried an interview with Richard Alpert. He had been one of the notorious LSD researchers at Harvard with Timothy Leary and had co-authored “The Psychedelic Experience”. But in the intervening years he had gone to India, met a Guru and become Baba Ram Das , the first American spiritual teacher of the Psychedelic Age. He was giving a lecture that Friday at Beverly Hills High School. When Ram Das spoke Vic was deeply moved yet, at the same time, excited. He was beginning to see what he wanted for his own life. Within a few days he became a non-drinking, non-drug taking vegetarian. Asking himself what he wanted to do most, he realized that he wanted to study Indian music. He bought a Sarod, the Indian instrument popularized in the West by maestro Ali Akbar Khan , and began to spend his days practicing Indian Classical music. On January 22nd, 1970 Vic saw an ad for a yoga class in the Melrose –Robertson area of LA. It was that night that he met Yogi Bhajan , who was to be his spiritual teacher for the next twenty years. “Yogi Bhajan was an imposing man, more than 6 ft 4 ins in height who carried himself like he was king of all he surveyed. I was quite overwhelmed with his personal aura that was extremely powerful. He asked me if I had any question about my future life. I told him about the sarod and how my ambition was to be a great sarod player. His answer shocked me. From that point on, Vic began to strongly practice a yogic discipline, rising every day at 3.30 am for 21/2 hours of yoga, chanting and meditation. He would attend at least one and sometimes two yoga classes every day. The sarod started to fall by the wayside in the face of this intense spiritual practice. Yogi Bhajan was sending people out to cities across the US and Canada to open yoga centers and teach. It came to Vic in meditation that there was a great opportunity to start a yoga center in London. 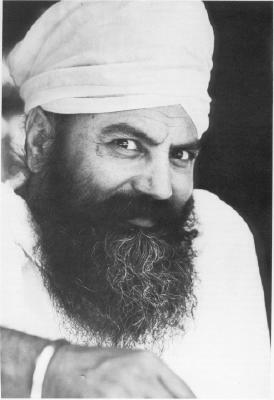 Yogi Bhajan was delighted at the idea and in December of 1970, Vic rented a basement flat in Notting Hill and began to teach Kundalini Yoga . Although Londoners were starting to take an interest in yoga, it was still considered rather a hobby for the lunatic fringe so times were very difficult. There were hardly any full time yoga studios in London at the time. Vic quickly discovered that he had become very Californian in his attitudes, finding that the cold, damp and gloomy London winter made him long for the sunshine of Los Angeles. Because Yogi Bhajan was a Sikh, Vic began to visit with the Sikh community in London, which, even in those days, was very large. The Sikhs took a liking to him and began to call him Vikram Singh, a Sikh name similar to his birth name. The more Vic found out about the Sikh approach to spirituality, the more it inspired him. In November of 1991 he was baptized as a Sikh, taking the name Vikram Singh Khalsa. The great saint Guru Nanak, born in India in 1469, founded the Sikh way of life . It is a simple, spiritual way of life that involves meditation, working righteously and sharing with others. After Guru Nanak, there came nine more human gurus who worked to expound the teachings of Guru Nanak and solidify the Sikhs into a community. Starting at first as an almost pacifist community they were forced by Mogul persecution to take up arms. The last human guru, Guru Gobind Singh (who died in 1704) gave the Sikhs the distinctive identity of uncut hair and turbans. Vikram was very impressed with the music at the Gurdwaras (Sikh Temples) in London. He began to study the music which is essentially vocal music generally sung to the accompaniment of a harmonium (a small, hand pumped organ like instrument) and tabla drums. The shabds (hymns) that are sung are based on Indian Classical Ragas, just as the sarod is so it was not hard for Vikram Singh to become proficient as a ragi (singer) quite fast. The British Sikh community was quite amazed. to see a young white man singing their own sacred music in such an accomplished manner and Vikram soon began to be invited to Gurdwaras all over England to sing. Meanwhile he was till teaching yoga, although now doing it wearing a turban in the Sikh tradition. One day a young woman came in to his class. She was stunningly beautiful. Vikram Singh, being the devoted yogi that he was, pointedly ignored her. Or, at least, pretended to. Her name was Kirsten Lindholm and she was making as career as a model and as an actress, having already appeared in several Hammer Films horror movies. After a few months she and Vikram fell madly in love with each other. Each one realized that something had to give. Vikram would not have anything more to do with the entertainment business, while Kirsten did not want to leave her rich and famous lifestyle. Back in California, the couple settled in Marin County near San Francisco where they soon had their first child. Marin County is the home of the Ali Akbar Khan College of Indian Music and Vikram Singh was able to fulfill his ambition to spend sometime studying with the master sarod player. In 1975, they moved back to Southern California. where Vikram Kaur gave birth to their second daughter in Anaheim. In 1977, Yogi Bhajan appointed the couple as co-directors of the Guru Ram Das Ashram of San Diego, where they ran a yoga center, trained yoga teachers and were the minister for the Sikh Community of San Diego. During their years there, the Sikh Community grew and eventually a non- profit organization was started in order to build a permanent Sikh Temple in the San Diego area. Vikram was one of the founding members of the organization. Vikram became the President of Sikh Dharma of San Diego, which was the religious non profit corporation, and also the representative of the 3HO Foundation which was the educational non profit set up to teach Kundalini Yoga. During this time Vikram had not neglected his musical studies. He continued to sing for services in the San Diego community, as well as traveling to Gurdwaras in other parts of the US and the world to sing. In 1979, he went to India. Singing in Gurdwaras all over the North of India, he was invited to sing in the most revered Sikh shrine, the Golden Temple of Amritsar, becoming the first non Indian to do so. In 1980 he had the privilege to repeat this pleasurable task. Today Vikram, now Antion Vikram Singh, still follows the Sikh way of life, rising early in the morning to meditate and basing his life on Gurbani, the message of Guru Nanak.